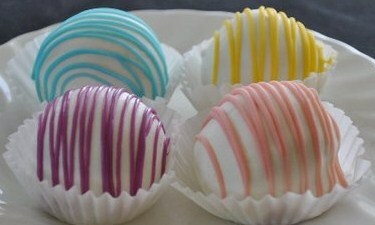 Cake Balls Egg-Cetera | Sweet . Sassy . and a bit Smart-Assy . For those of you who have no idea what a cake ball is, you are in for a treat (no pun intended)! The name cake ball is pretty self-explanatory. Basically it is a ball of cake dipped in chocolate. Sounds pretty great, right? That’s because they are! Maybe I am biased but my mom makes the absolute BEST cake balls. I’m not the only one who thinks so either! We have had some major cake ball addicts tell my mom that the ones she makes are better than any others they have tasted and they keep coming back for more. 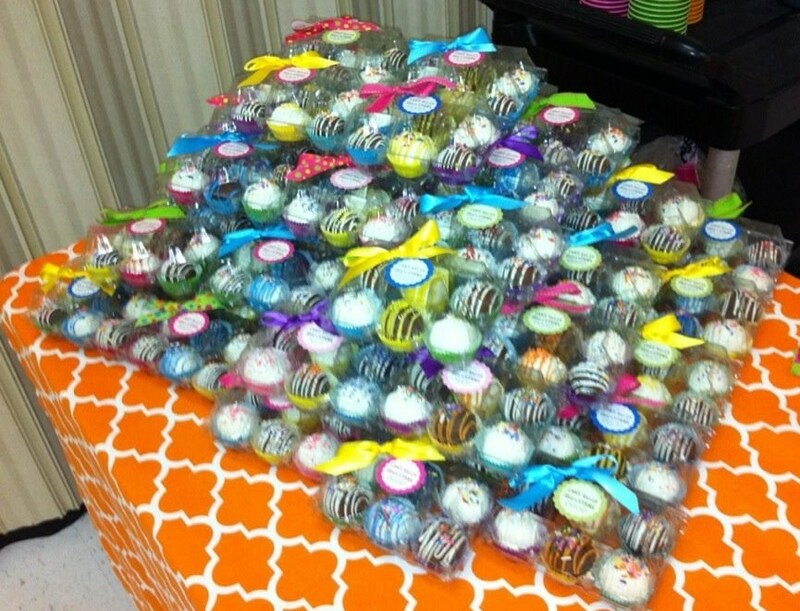 My mom started a side business called Cake Balls Egg-Cetera back in April 2011. You may be wondering how she got into this and where the name Cake Balls Egg-Cetera came from…Well, it all started back around October 2010. My dad’s side of the family is HUGE so when the family Christmas party rolls around, the adults don’t really do gifts or anything like that but we always bring food and desserts. Mom wanted to do something different but had no idea what to do. One day she saw a sign outside of a bakery that was advertising “Cake Balls.” My mom thought, “What in the world is a cake ball?” so like any normal human being, when she got home, she Googled it. Mom found different recipes and thought she would try them out because they seemed very simple. Well, let me tell you that it is a good thing that she started experimenting with them in October because it took her 2 solid months to become good at making them to where they were appealing to the eye. We have seen some cake balls in bakeries that are either pretty because they are coated in Fondant but taste terrible or hideous with lumpy chocolate and poor decorations. Over the past year she has tweaked her method and recipes and has found the perfect balance! They are gorgeous and absolutely delicious! Anyways, back to my story about her starting and naming a business…Mom made all of these cake balls for Dad’s side of the family but had no idea how to store them. Quite the predicament seeing as she had made about a dozen per family member. At the time my family raised chickens so obviously we had egg cartons. Dad had the bright idea of storing the cake balls in the egg cartons. They were the solid brown, cardboard type cartons but the cake balls fit in them perfectly. Mom slapped on a sticky Christmas bow and took them to the party and everyone LOVED them. They all kept saying that she needed to start a business because they were so professional looking and tasted great. And that’s just what she did, hence the name Cake Balls Egg-Cetera. Now she has the clear, pretty egg cartons instead of the not-so-appealing brown ones (and we got rid of the chickens, thank God). Before I found a job after I graduated college, I helped her business by doing what I could while she was at work (this is a side business, remember? so this woman still works full-time). It took me some time but I finally got the hang of making the cake balls but Mom is still way better. She just has a natural ability at it or something. I usually get stuck baking the cakes and rolling the balls since she is better at decorating them which is fine with me because it is fun for us to do something like this together. Lately, Mom has been getting herself prepared for the holidays because this is the time of the year when she gets super busy. She stays busy throughout the year with baby showers, weddings, birthdays, other holidays, and just random orders but around Halloween, Thanksgiving, and Christmas she gets swamped. She makes all different kinds of flavors: Vanilla, Chocolate, Strawberry, Red Velvet, Banana, and Spice (similar to carrot cake). And she dips them in either Milk Chocolate, White Chocolate, or Dark Chocolate. My personal favorite is Strawberry dipped in White Chocolate. YUM! 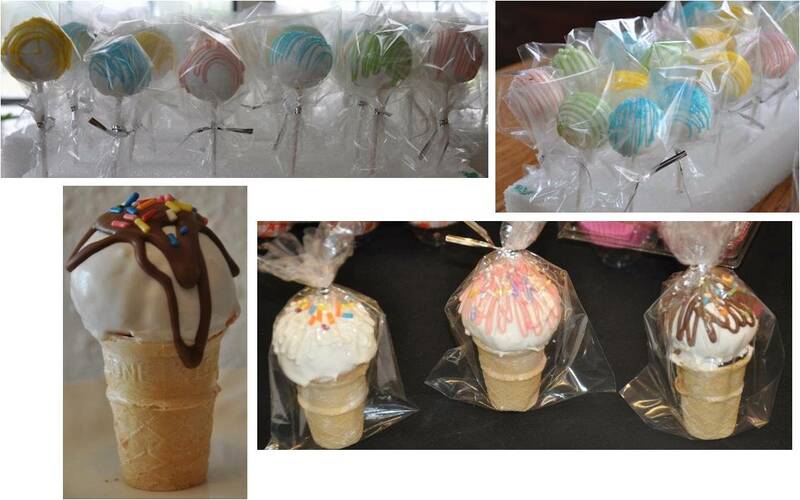 Mom has even ventured out to do Cake-Pops and Ice Cream Cones! 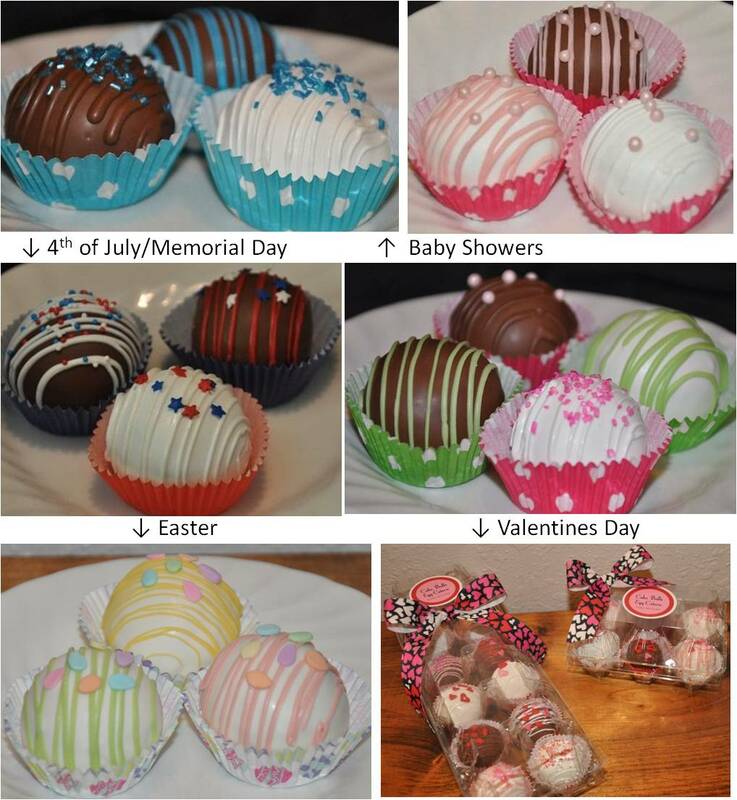 If you want to order some Cake Balls, you can either call my mom at 936-524-3461 or e-mail her at cakeballseggcetera@gmail.com! You can also check out her page on Facebook. Just search for Cake Balls Egg-Cetera and you should be able to find it! The typical packages come in dozens or 6-packs. Just let her know if you have any special requests! You can order any flavors and dips that you want (minimum of 1/2 dozen per each cake flavor ordered) but Mom usually needs about a week in advance, especially on the bigger orders. Check out this HUGE order of 60 6-packs for Teachers Appreciation Week! I want a cake ball! She is definately a very talented lady (and does all this while working full time too!). I’m jealous!! I can testify that these pretty little balls full of goodness are delicious, and addicting! Now I want some too!